JM: The sports category is always a good one from a purpose perspective because the watches are supposed to be good for sporting activities and thus anything that seems delicate or hard to read can immediately be taken out of the running. It is easier to judge watches based on their ability to perform under a set type of circumstances than it is to judge whether a watch is a better watch for a human than another. Of course, being “sporty” doesn’t necessarily mean it is capable, so one still needs to assess the inherent qualities behind construction, legibility, and durability. These qualities make for a great sports watch. AT: With so many sports watches on offer in 2018, this seems like a strange lineup. MG: I don’t know what it is this year with the Sports category, but I cannot get excited about it. Perhaps because three of the six watches are re-issues of vintage watches? While all of them are very well made, it seems that innovation in this category is a bit lacking in 2018. But maybe the watches in this category are also a large part of what customers want nowadays from a sports watch? MG: It is sad to say that the only breath of fresh air in this category has to come from a pocket watch: a beautiful concept very well executed! Practical? No, as I see very few people taking a 60 mm pocket watch with them when they explore mountains, although the light weight of the titanium might help to keep the weight down. However, this is by far the most innovative concept that I see in this category this year, and I therefore choose it as my winner here. RS: I have read the description for this pocket watch and I remain a little confused: is this a one-hand watch with seconds subdial? I think the central red hand represents the hours (24) and the white hand is the chronograph seconds. The 30-minute register is not specified as the chrono register in the description, but I cannot imagine this is a regulator that only tracks to 30 minutess or that the chrono is a one-minute chrono! Anyway, I like it for its quirky layout, but I deduct masses of points for the wrist strap that this comes with. I have seen pictures of guys wearing pocket watches on their wrists and it’s not pretty; although it does make me chuckle to think of a chap of extraordinary net worth dressing up like a 1920s mountaineer so he can properly enjoy his new pocket watch. AT: It’s a bit of a mashup this one. I love the Minerva movement, but it’s a little strange – I think it’s trying too hard. A titanium case, wearable on a strap, looks like a stopwatch, has a compass, and one hand for the hours and minutes is just too much. I like aspects of it, but I don’t like the fact that it’s trying so hard to be a modern relic of the past (and I dislike single-hand watches). JM: In third place I choose the Montblanc 1858 Pocket Watch as it is clearly designed for the rugged overland explorer. Built as a pocket watch instead of a wristwatch, this allows the addition of a compass on a flip-out rear case, super useful when winding your way through craggy rocks on the side of a mountain range. The case also folds out flat to be used when orienteering on an expedition, showing both the time and compass. It also includes the historic Minerva monopusher chronograph and a stone dial that makes it feel like it is part of the world you are exploring. The main reason I don’t choose it for the winning spot is largely due to the fact that it isn’t a wristwatch and it is rather large and uses a movement that does not represent the latest in timekeeping technology. The watch is awesome, and if it had a price similar to the TAG Heuer or Seiko, I would buy it for my exploring in a heartbeat. IS: Are you kidding me? A brand poetically describes a pocket watch as being inspired by those used in mountain exploration a century ago and it is pre-selected as a top-six sports watch of the year? I suppose it does have a compass . . . so orienteering? With a pocket watch? And where to attach the fob chain wearing tennis whites, jogging, etc.? Don’t get me wrong, I really do like the Montblanc 1858 Pocket Watch Limited Edition 100 and think the movement is divine. And the faux-mountain style works for me. As a look, I do not consider a pocket watch a serious sports watch unless in the dress code of a Distinguished Gentlemen’s Penny Farthing race. For more information please visit gphg.org/horlogerie/en/watches/1858-pocket-watch-limited-edition-100. RS: Ulysse Nardin’s Marine Regatta won this category last year, and yet a simpler UN has stolen my heart for the second year in a row! This is one of very few modern divers that I would like to wear. I love that it has a reserve indicator as I think that better satisfies the ISO requirements, and if you have to use a date window I like it to be positioned at 6 o’clock. Overall the design of this watch hits the spot without following in the wake of a Rolex Submariner. MG: My first response is that this is a nice watch, but again the originality is limited as we know this configuration from Ulysse Nardin so well from the Marine collection. I don’t think that it becomes any better as a diver, nor worse. That makes it a great watch for whoever is attracted to its design, but regarding this category not a high-flyer in my book. AT: Another UN-massacred date window on offer, and I don’t like subsidiary seconds on a dive watch – or a power reserve for that matter. This watch ticks all the wrong boxes for me. IS: I’m also turned off by that little date window, Ashton, as if that section of the dial already packed with small seconds dial needed to be any busier. On the plus side, it boasts an in-house movement with silicon escapement and a very legible dial and bezel. On the downside, the Ulysse Nardin Diver is directly up against the very strong Seiko Prospex 1968 Diver’s Re-Creation as the only two non-chronographs in the field and both are diver’s watches as well. JM: For third place I am stuck between two watches that are very different but do what they are intended to do very well: one of these is the Ulysse Nardin Diver as it is the most practical, down-to-earth diver in the group and it doesn’t seek to mimic every diver in history or masquerade as something it is not. The functions are crisp and due to the dark-blue-and-white combination, legibility is not an issue. The main reason that is doesn’t take the top spot is the dial gets a little busy with the small seconds and power reserve, both might make legibility underwater not as great as another diver in this competition. It was a close call, though, and this is a very solid diver for anyone looking to explore the depths. For more information please visit gphg.org/horlogerie/en/watches/diver. JM: As I’ve said before, I will always have a strong opinion of the Fabergé Visionnaire Chronograph thanks to the revolutionary AgenGraphe movement inside. And this version, the Chronograph Dynamique, takes the cool and logically legible layout of the Visionnaire Chrono and adds titanium and ceramic to make it ultra-durable. This durability matches the movement inside, which was literally engineered to withstand shocks and jolts during chronograph operation like never before thanks to abrasive, coated wheels that use pressure instead of gear teeth to drive the chronograph, reducing the likelihood of wheel damage. That, along with a variety of other innovations that were detailed when it was launched make this an amazing chronograph, and this version makes it a fair amount sportier than its predecessor. I am voting largely for the movement and the layout, but the execution by Fabergé cannot be dismissed. It is an ultimately awesome watch, and I think has a fair shot at winning the category should the jury take the time to appreciate its qualities as a durable and reliable sport chronograph. AT: Other than the fact that this watch is a chronograph (which the press release mentions multiple times), I don’t see this being a “sports” watch. Watches especially for motor racing, scuba diving, and mountain exploration are sports watches; I just don’t know what this is. But then again, what actually makes a “sports watch”? IS: Au contraire, Ashton: timing sports is what makes a chronograph a “sports watch.” It doesn’t require the words “motor sports” to be stamped on the dial to be a sports’ watch. But in a class with four pre-selected chronographs it’s how well the watch times the sports that counts, and here I think the Fabergé Chronograph Dynamique shines as it is the most legible and the most innovative chronograph in this field. With the chronograph display around the perimeter of the dial, the Chronograph Dynamique is by far the most “tool” watch in this field in that it is first and foremost optimized to be a chronograph with time telling relegated to a secondary function (see The AgenGraphe By Agenhor: The Most Significant Chronograph Since . . . Since The Invention Of The Chronograph (With Videos). The fact that the Chronograph Dynamique was both conceived and executed to optimize its function as a (sports) chronograph/race timer over time display, Fabergé is my predicted winner in this category. MG: While I like the combination of black ceramic and titanium in conjunction with the orange details, the Visionnaire Chronograph doesn’t tick many boxes for me. Bringing all the chronograph functions to the center of the dial is a novel idea, but it requires a rather complex movement to do so, and I personally still prefer conventional hour and minute totalizers, which makes it easier to read for me. As most people do not use a chronograph several times a day, the added value seems to be a bit lost, at least to me. It also doesn’t help that the Singer Reimagined version is competing in the Chronograph category and that last year this watch with red details was also entered in the Chronograph category but didn’t win. So perhaps it is hoping for less competition in a different category? RS: I love this chronograph, and I particularly prefer this titanium-and-black ceramic iteration with those orange accents. While I can’t see myself actually doing much sport with this watch, it is hands down the coolest thing in the group, so I’m going to bank on it winning. I should mention that a similar ceramic Visionnaire was in last year’s Chronograph category. The GPHG seemingly can’t stop shuffling its categories around, in any case I am quite strict on seeing the same watch re-enter over multiple years, so I’m going to demote the Visionnaire to my second-place pick. For more information please visit gphg.org/horlogerie/en/watches/visionnaire-chronograph-dynamique. AT: Easily the pick of the lineup for me. The Seiko is a beautiful vintage throwback that has been tastefully designed. We can see a nod to times past without being gimmicky like many other brands do. As far as sports watches go this is the ultimate with a screw-down crown, legible dial and hands, full minute markings on the bezel, a date window, and impressive water resistance. Combine all the above with a high-beat movement and decent power reserve and the fact it’s all wrapped up in an impressive-looking package, this is one watch not to be messed with. The category’s clear winner. IS: I’m no fan of recreations just because they are recreations, but the Seiko Prospex 1968 Diver’s Re-Creation is a superb watch regardless: 300-meter depth resistance, high-speed balance, and excellent legibility make this a great watch for its intended purpose. Nothing fancy, it just does the job perfectly, which earns it my number-two pick. RS: I have “vintage re-creation” fatigue! This one is really nicely done, to be fair, and I like that it is essentially the anti-Grand Seiko. A few purists, including myself, felt that Seiko took the wrong logo off the dial this year when it announced that it was dropping the additional Seiko from the Grand Seiko dials. So in this model, you have a plain Seiko, but a Zaratsu-polished Shizukuishi Watch Studio Seiko! Gosh, I might prefer the UN diver but I’m (not so) secretly hoping for this to win. MG: I am never a big fan of re-creations for the simple reason that there is always a more desirable original out there. Nevertheless, this is the Seiko of perfection that we have come to grown accustomed to with the brand. The perfect watch for those who don’t want to hunt down the original or prefer to have a more modern-made watch. JM: In second place I chose the diver that is fundamentally the purest among the bunch, the Seiko Propsex 1968 Diver’s Re-creation. The watch is simple, to the point, and provides great legibility and a very wearable size for a diving watch. Being a Prospex, it is also very tough and accurate, basically representing the sport-oriented version with a high-beat movement that is a step down from Grand Seiko quality. Being historically inspired by the first Seiko diver, it also tugs at the heartstrings of all those who love Seiko and its heritage. The main reason I can’t choose it for the winning spot is the same reason I don’t choose many: it does not necessarily represent the cutting edge in any area of horology, even if it does display tried and true quality. It is a fantastic watch, just not as forward leaning as others. For more information please visit gphg.org/horlogerie/en/watches/seiko-prospex-1968-divers-re-creation. AT: This is a classic watch with close ties to motor racing fitting the bill well. RS: This is probably the coolest iteration of the Monaco with the exception of the bonkers V4. I like the look of this beast, but I can’t ignore the fact that it is quite uncomfortable to wear – I want to be conscious of my watch while I’m winning Le Mans, sure, but in a good way, not a bad way! AG: Just basing my thoughts on design here, I’ll go for the TAG Heuer Gulf. I like form watches, I like the fact that the crown is on the left side (Heuer had done this originally to show that the watch was automatic and didn’t need to be wound), and the color scheme is quite graphic. JM: I recently wrote about the TAG Heuer Monaco Gulf Special Edition, and I can say that this is a fabulous chronograph that touches the hearts of any race enthusiast. The build quality is great and while the legibility may not be as perfect as a faster-paced chronograph, it works for the armchair race car driver perfectly fine. It uses an older style movement so, like others, the technology isn’t exactly the most up to date. While that isn’t a huge issue, when competing against others for the title of best sports watch of the year, I think it falls short of truly being what an athlete, racer, or adventurer might want with them during the grueling push. Still in love with those colors, though! 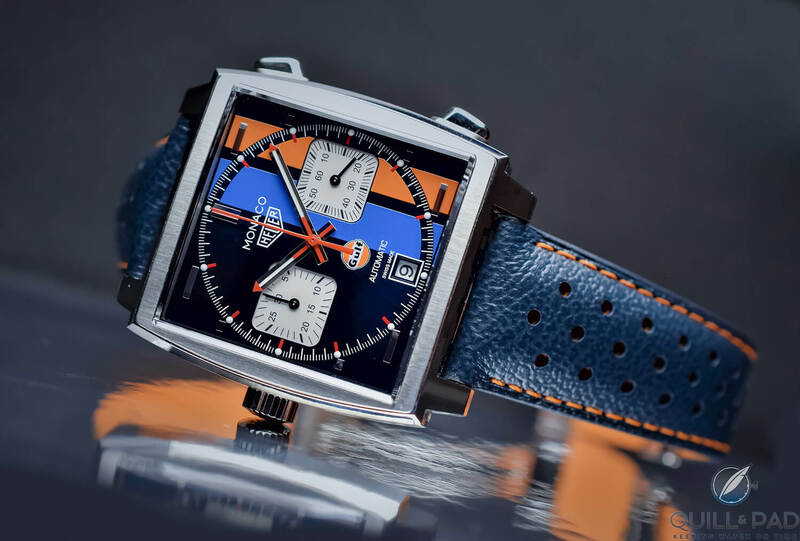 IS: I really like the design of the TAG Heuer Monaco Gulf and the respecting of codes like the left-hand crown, but I can’t help feeling that this model is all about design and any link to motor racing is just in the marketing blurb. A great-looking chronograph and an eye-catching TAG Heuer Monaco, but as a sports watch I think there are stronger in this field. That said, I’d like one. MG: As the Seiko has “re-creation” in its name, this TAG Heuer should have it as well. We’ve already seen this watch with slight variations for quite some time now and it remains one of the iconic sports chronographs. I hope that its reputation is enough to secure a win as otherwise there is very little in this watch that we don’t know already. For more information please visit gphg.org/horlogerie/en/watches/monaco-gulf. JM: The Zenith is a great pilot-style chronograph with a flyback movement, something very useful in a chronograph used for actually timing things. The Pilot Cronometro Tipo as a sports watch should be great, but the use of bronze technically makes for a case that is susceptible to the elements and will corrode over time. In the age of titanium, carbon, and ceramics, I think that is unacceptable for a watch intended for sports use. As a collector’s watch it is awesome, and I love the variety, but for a sports watch needing to be rugged, it feels like it is executed in the wrong material. The legibility is great, even if the dial finish is a bit too much visually, and the case and pusher structure is on point, not to mention the high-beat movement. My main gripe comes down to case material, and the lack of any true innovation keeps it from the top spot for me. MG: It is sad that by this point I don’t know what to say about these vintage re-creations and still continue to sound mildly original in my opinions. Again, a great watch, well executed, but in that matter it doesn’t have anything more or less than the TAG Heuer or the Seiko to bring to the plate. A watch that will make a lot of watch enthusiasts happy when they have it on the wrist, but to secure a win in this category I am hoping for a bit more. IS: A flyback chronograph deserves serious respect, and the Zenith Pilot Cronometro Tipo CP-2 Flyback is a serious flyback chronograph. I quite like the design, but it’s time the Zenith El Primero movement was awarded lifetime recognition by the GPHG as a condition for not entering it any more (same for the Tudor Black Bay). It is a flyback, though, and I tip my hat at that. While there’s obviously a big market for revival models that are well done, I’d like to encourage designers to look to the future rather than the past. AT: Flyback chronographs are cool watches, it’s undeniable. Some of the early Longines 30CH flyback chronographs are exquisite. I’m not in love with bronze watches, and this one is no exception. I also find the black bezel not really fitting. RS: I have a passionate dislike for fauxtina and bronze cases, so I guess it’s testament to this watch that I don’t want to throw it against a wall. I still don’t like it, though. Why not make one that looks new, like all those vintage watches we love would have originally looked?! Let us age our watches ourselves, for goodness sake! For more information please visit gphg.org/horlogerie/en/watches/pilot-cronometro-tipo-cp-2-flyback.